Out & About Carpets offer a unique “choose at home” flooring services and carpets in Bredbury as well as right across Stockport and surrounding areas – saving our customers time and money – whilst supplying the finest quality flooring and carpets in the process. Quality Laminate, Vinyl Flooring and Carpets in Bredbury – from Stockport’s most unique Flooring Company. Quality assured Carpets in Bredbury- with samples brought to your home. A selection of leading brands, at great prices – covering every room in your house. For quality vinyl flooring in Bredbury, we can bring a wide selection of styles and designs to your home. Perfect for the busy family home! Looking for laminate flooring in Bredbury? We will bring a wide selection of options for you to look through – and make choices from the comfort of your own home. Browse through a selection of our recent client case studies for carpets supplied and fitted in Bredbury and across Stockport. We have some great examples of supplied and fitted Laminate Flooring in Bredbury and across the Stockport area. See how we have helped customers with supply and fitting of vinyl flooring in Bredbury and across Stockport and south Manchester. 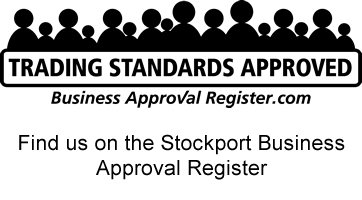 Because we are approved by Stockport Trading Standards Business Register, our Unique “choose at home” service you know you are in safe hands. We love to put customer service as a number one priority. With plenty of reviews online though, this can tell you more about our service than we ever could. If you are looking for flooring or carpets in Bredbury we hope we are the sort of company you would trust to work with. Why choosing Out & About for your flooring and carpets in Bredbury saves you time & money! By bringing our flooring and carpets to the home, we can offer a more personal level of service. Not only this, but you would be better placed to make the right judgement about the flooring and carpets that would meet you needs and suit your property. We are competitive because we don’t have any retail shops with large overheads. We can pass these savings onto you through our pricing. No gimmicks. No misleading discounts. Also, because we are a stone’s throw away from Bredbury, because we come to you, we can save you time & money. Looking for carpets in Bredbury? Laminate or vinyl flooring? We want to hear from you.